Starting in version 10.2, users are able to process credit cards in the Prepare Invoices window. This means that multiple invoices can be created in a batch, and credit card charges can also be processed in a batch. 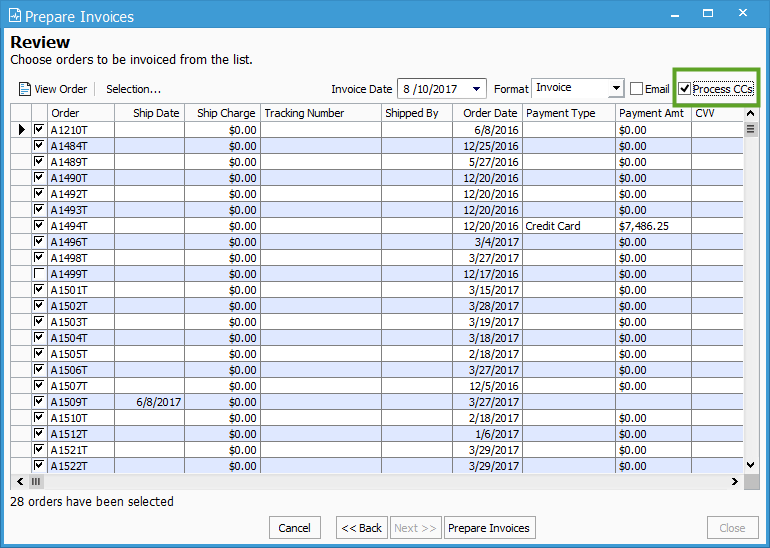 Acctivate has the ability to process credit cards when creating an Invoice from a Sales Order (see our Process Credit Cards help article). Starting in version 10.2, the Prepare Invoices wizard will have a “Process CCs” option. When this is enabled, all eligible orders selected will charge the related Credit Card, just as it would if invoicing a single Sales Order.